We have a new advertiser joining us which is actually a group of 40 businesses in the tourism industry which is based on the south side of Loch Ness. This means that as well as accommodation you can also find good restaurants and pubs, loch cruises, and many other facilities to make your holiday a great one. This is actually the first time we've attracted a general tourism group to advertise with us so I hope you'll all take the chance to visit their site to see all they have to offer. Welcome to South Loch Ness, Scotland, a world class tourism destination and an area of great diversity and outstanding natural beauty that covers an area from Inverness in the north, and follows the entire length of the wild and rugged south eastern shoreline of Loch Ness all the way to Fort Augustus in the south, and eastwards to Daviot through fertile farmland and the scattered communities in Strathnairn. The area has been referred to as the Scottish "Lake District" so numerous are the Lochs in this part of the Highlands. An undiscovered, unspoilt land of craggy hills, lochs, tumbling waters and heather moors will delight and inspire all who value true wilderness, yet so close the Highland capital city of Inverness. Almost all outdoor activities are available here, the very best Loch Ness cruises and tours, climbing, Deer Spotting, walking and wildlife guides as well as several first class golf courses and water sports facilities within easy reach. We have pet friendly accommodation including holiday inn, hotels, guesthouses, bed and breakfasts, and self catering cottages, lodges, and chalets, to suit all budgets. Visit the Loch Ness Monster Exhibition and shopping complex, whisky shop, restaurant, heraldry, gift shops at the Drumnadrochit Hotel. The locals and businesses alike, proudly call this part of Scotland "special" and work hard to preserve and protect the local environment. We actively encourage environmentally friendly, green tourism business, in a determined effort to preserve this unspoilt corner of the Scottish Highlands for generations to come, hence our "walk on the wildside" image, which is widely acknowledged throughout the Inverness and Loch Ness region as a sign of the environmentally aware communities of South Loch Ness. You can find them at http://www.lochnesswelcome.co.uk/index_se.asp and the "Visit Loch Ness" button in our header will also take you there as well. On a downside note I was asked about the vbulletin service by many of you this week. In fact I think I got some 30 or so emails. I'm sorry to say that Steve still hasn't managed to get this up and to be frank I now have absolutely no idea when he's going to manage it. I am starting to consider paying the software company to get it installed. I really don't know what is happening to Steve as he just seems incapable of doing anything on the site other than keep it running (which is not unimportant). I had hoped that with his move to Michigan and getting together with family and friends again that he'd be motivated to do some work for us. And so I've given up making excuses for him and will need to look for other solutions to getting these technical issues dealt with. And so if you know someone with good technical knowledge about dealing with installing scripts, php, sql, and on a windows server platform do let me know. Also I got some emails in asking about the Knights Templar International event in Toronto in 2010. I'm told the dates for that are from September 22 to the 26th. The likely main hotel will be the King Edward but that has still to be confirmed. As I understand it the welcome dinner is on the 22nd and the farewell breakfast is on the 26th. National Recognition of Tartan Day and Maple Leaf Tartan in Canada. As many of us know, Canada has a long rich history of Scots immigrating to this Country from our early days to the present. Many of our institutions throughout our country can be attributed to these Scots ancestors and their contributions to our education, banking, government, and legal systems. That is why I am writing you, on behalf of The United Council of Scots of Atlantic Canada, a council of representatives of Scottish societies, in the four Atlantic Provinces. We are asking Scottish groups across Canada to come together, for the first time in history, to ask the Canadian government to proclaim, through legislation, April 6 as Tartan Day. We are, at the same time urging that the Maple Leaf Tartan be officially proclaimed as our nation’s national tartan. As you are aware, Tartan Day began 22 years ago by the Federation of Scottish Clans in Nova Scotia to commemorate the contributions Scots have made to our country. They chose, in 1986, April 6 – the date the Treaty of Arbroath was signed seven centuries ago. Since Tartan Day was first proclaimed in Nova Scotia, that date has been adopted by Scots world-wide as a day to commemorate and celebrate their heritage. Tartan Day has been proclaimed as an official date of commemoration by nations around the world, including the United States but, even though it is recognized by all Canadian provinces, it is not yet recognized by our Canadian government and our Maple Tartan has never been officially recognized as Canada’s Tartan. We know we cannot do this alone and therefore we need support from Scottish groups from coast to coast. We are asking your group to contact us if you are interested in taking part in this historic movement. I would also ask that you contact any group or provide us with their contact information for a group you may think might be interested in joining the campaign. Once we make contact we will begin the process of implementing our plan of action. If someone from your group could reply by March 31, 2009, I would be most appreciative. 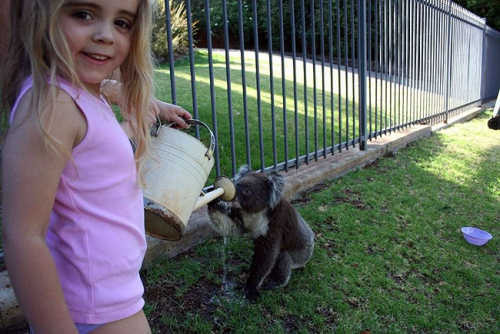 The first is a picture of a Koala that needed lots of water due to the terrific heat in Australia and I thought you might like to see it. God only sends somebody with this talent around every once in a while. Listen to these and check out the others too, they are all unbelievable. And there are more clips on the site. This weeks Flag is compiled by Richard Thomson. In this issue he is exploring the economics of Nuclear Energy and also discussing the Council Tax. Regular visitors will have seen that I intended to return to my cauf-kintra, the Granite City of Aberdeen, on 7 February 2009 for the Aberdeen-East Fife Homecoming Scottish Cup tie. Unfortunately the game was postponed owing to snow, not on the Pittrodrie surface, but on the roads around the city, however the East Fife team bus finally made it this week (Tuesday) and, apart from the result, The Fife’s supporters enjoyed their day out against a ‘big team’. After taking in the East Fife kit, I enjoyed the game from the comfort of a hospitality box (including a steak pie and coffee at half-time) with my Don’s scarf in my pocket! For the benefit of the Australian- based East Fife supporters who visited Bayview last season, you can click http://www.eastfife.org/match_report_detail.php?id=137 for a match report courtesy of Alan Henderson and James Corstorphine. I will be making a swift return to Aberdeen to take in a touring exhibition celebrating the 250th anniversary of the birth and life of Robert Burns. From now until Sunday 11 April 2009, ZIG-ZAG: The Paths of Robert Burns will be on show at Aberdeen Art Gallery. Zig-Zag has already been on show at the National Library of Scotland in Edinburgh and will following the Aberdeen dates move on to Dumfries from Wednesday 1 July to Monday 31 August 2009 (venue TBC), and finally Glaswegians can enjoy it at the Hunterian Museum from Monday 21 September to St Andrews Day 30 November 2009. The title of the exhibition comes from Burns’ famous autobiographical letter of 1787. In it Burns explores the course of his life, insightfully observing that “…keen sensibility and riotous passion may still make him zig-zag in his future path of life.” The exhibition examines all the contrasts in Burns’ life and shows in his own words, how he travelled through it. Visit http://www.zigzagburns.com for full details of this major tribute to our National Bard, which is part of Homecoming Scotland 2009. Prior to Tuesday’s game I enjoyed a mammoth haddock which inspires this week’s recipe – Smoked Haddock with Chive, Pea and Potato Crust. Method: Cook the potatoes until tender, then add the frozen peas for the last 2 minutes of cooking. Gently crush with half the butter. Heat the rest of the butter in a pan and cook the haddock for 3 minutes on each side. Remove the haddock then add a splash of wine or chicken stock and reduce a little. Stir in the chives. Put the potato on 2 plates, top with the haddock and the chive butter. Christina McKelvie's Weekly diary didn't make it in this week. It happened on an evening about the close of the following spring, when the oat braird was flourishing, and the barley shot its sharp green spikes above the clod, carrying the dew on the third morning, that Ezra Peden was returning from a wedding at Buckletiller. When he left the bridal chamber it was about ten o’clock. His presence had suppressed for a time the natural ardour for dancing and mirth which characterises the Scotch; but no sooner was he mounted, and the dilatory and departing clatter of his horse’s hoofs heard, than musicians and musical instruments appeared from their hiding-places. The floor was disencumbered of the bridal dinner-tables, the maids bound up their long hair, and the hinds threw aside their mantles, and, taking their places and their partners, the restrained mirth broke out like a whirlwind. Old men looked on with a sigh, and uttered a feeble and faint remonstrance, which they were not unwilling should be drowned in the abounding and augmenting merriment. The pastor had reached the entrance of a little wild and seldom frequented glen, along which a grassy and scarce visible road winded to an ancient burial-ground. Here the graceless and ungodly merriment first reached his ears, and made the woody hollow ring and resound. Horse and rider seemed possessed of the same spirit—the former made a full halt when he heard the fiddle note, while the latter, uttering a very audible groan, and laying the bridle on his horse’s neck, pondered on the wisest and most effectual way of repressing this unseemly' merriment-of cleansing the parish of this ancient abomination. It was a beautiful night ; the unrisen moon had yet a full hour of travel before she could reach the tops of the eastern hills; the wind was mute, and no sound was abroad save the chaiing of a small runnel, and the bridal mirth. Added another four pages which include Cocktail, Cocoa, Cocoa Butter, Cocoa Pudding, Coconut, Coconut Biscuit, Coconut Cake, Coconut Cream, Coconut Drop, Coconut Fibre, Coconut Oil, Coconut Pudding, Coconut Pyramid, C.O.D., Cod, Cod Recipes, Codicil, Codling Moth, Cod Liver Oil, Coelogyne, Coffee, Coffee Cream Sandwich, Coffee Éclair, Coffee Icing, Coffee Melange, Cognac, Coil, Coins. Note to Sections VI. and VIII. and Errata, and Addenda as to the Lews, &c.
I. THE TWEED; THE BORDER COUNTRY; THE FOREST (SELKIRK and ETTRICK), and CLYDESDALE—General Features, 2.—Outline of Tour to these Districts, 3.—Edinburgh to Melrose: Dalkeith; Lasswade;.Hawthornden and Roslin, footnote; Borthwick and Crichton Castles; Currie Wood; The Gala Water, 4.—Galashiels; Bridge-end; Darnick; Skirmish between Bucclench and Angus, 5.—Melrose Abbey, 6.—General Character of the Tweed, 7.—Old Melrose; The Cowdenknowes; Earlstoun, 8.—Dryburgh; St. Boswell's; Littledean Tower; Smailholme Tower, 2.—Kelso and Abbey; Roxburgh Castle; Fleurs; Home Castle; Ednam — Kelso to Berwick: Flodden; Hollywell Haugh; Norham Castle; Halidon Hill; Berwick, footnote, 10.—Kelso to Jedburgh: Penielheugh; Vale of the Jed; Bonjedward; Jedburgh Abbey; Ferniehurst., 11.—Jedburgh to Hawick: Minto House; Monteviot; Denholm; Battle of Ancrum Moor, 12—Hawick; Bransholm; Goldieland Tower; Harden Castle; The Cheviot Hills; Langholm; Gilnockie Tower; The Esk; Netherby Hall; Longtown; Liddesdale; Hermitage Castle; Hawick to Melrose: Mangerton Tower, footnote, 13.—Melrose Abbotsford and Selkirk: Abbotsford, 14; Selkirk; Ettrick Forest; Philipbaugh; Oakwood Tower; Tushielaw; Thirlstane Castle; Ettrick Churchyard and Village, 15.—Moffat Wells—Moffat to Selkirk, by Yarrow: Loch Skene; The Grey Mare's Tail, 16.—The Covenanters; St. Mary's Loch; Henderland Tower; Dryhope Tower; The Yarrow; Altrive; Mount Benger; Blackhouse Tower; Upright Stones near Manse of Yarrow; Newark Castle; Sweet Bowhill; Carterhaugh, 17. Selkirk to Peebles: Ashiestiel; Elibank Tower; Inverleithen; Traguair; Horsburgh Castle; Border Peels along the Tweed; Peebles, 18.—Peebles to Lanark; Nidpath Castle; Drummelzier; Biggar; Carnwath; Cowdaily Castle; Wilsontown Iron-Works; Edinburgh and Glasgow Forks of Caledonian Railway, 19.-Lanark; Falls of Clyde; Cartland Crags-Lanark to Hamilton: Craigncthan Castle; Battle of Drumclog; Cad-cow Castle; Wild Cattle, 20.-Hamilton Palace-Hamilton to Glasgow: Battle of Bothwell Brig; Bothwell Castle; Blantyre Priory; Rnthcrglen; Battle of Langside, 21. II - EDINBURGH TO GLASGOW AND AYR, AND THE LAND OF BURNS, THE COASTS of GALLOWAY AND DUMFRIES. - Most Striking Points on Glasgow Railway Line; Viaduct over the Almond; Niddry Castle, 22.-Linlithgow Palace and Church, 23.-Falkirk; Diverging Railway Lines, 24.-Country from Glasgow to Ayr; Lochwinnoch and Ailbirnie Loch; Crookston Castle; Paisley; Elderslie; Branch to Kilmarnock; Kilwinning; Ardrossan; Eglintoun Castle, 25.-Ayr; Burns' Monument and Birthplace, and other Localities connected with his Name and Works, 26.-The Carrick Shore; Colzgn and Turnberry Castles; Maybole Parish, 27.-Coasts of Galloway: Dundrennan Abbey; Balcarry Shore; Colvend; Sweetheart Abbey, 28.-Dumfries: Lincluden Abbey; Caerlaverock Castle; Lochmaben and Castle; Dumfriesshire, 29. III - MAIN RAILWAY LINES THROUGH SCOTLAND.--(1.) Berwick to Edinburgh: General Features of the Country; Spots of Interest; Battles of Preston-pans and Pinkie; Conference at Carberry Hill, 3O.-Dunbar and Castle; Church; Works on the Line; Holly Hedges at Tyningham ; Coldin-ham Priory; Fast Castle, 31.-North Berwick; Tantallan Castle; The Bass Tock; Haddington; Abbey, 32.-(2.) Caledonian Railway, 33.--(3.) The Edinburgh, Perth, and Dundee Railway-Grange House; Kirkcaldy; Falkland Palace; Wilkie's Birth-Place, 34.-St. Andrews; Cathedral; Tower and Chapel of St. Regulus, 33.-Perth Branch-Lindores Abbey; Round Tower at Abernethy; Moncrieffe Hill, 36.-(4.) The Scottish Central Railway-General Course, 37. The adjoining Scenery of the Devon; Alva Glen; Dollar; Castle Campbell; The Caldron Linn; The Rumbling Bridge, and the Devil's Mill, 38.-Dunfermline; Malcolm's Tower; Abbey Church; Palace; Clackmannan and Alloa Towers, 39.-Bridge of Allan; Kipperness Sycamore Tree; Dunblane; Cathedral; Archbishop Leighton's Walk and Library; Battle of Sheriffmuir; Forteviot; Tunnel at Moncrieffe Hill, 40.-(6.) The Perth and Dundee; Dundee and Arbroath; Scottish Midland Junction, and Arbroath and Forfar Railways: Carse of Gourie; Dundee; Glammis Castle; Arbroath; Abbey of Aberbrothock, 41.- (6.) The Aberdeen Railway: Montrose; Brechin; Church and Round Tower; Dunnotar Castle, 42. Have now concluded this book by adding the Appendix which actually contains some interesting on Vitrified Forts. Letter from DR. JOSEPH BLACK, Professor of Chymistry in the University of Edinburgh. "SIR,—I am much obliged to you for the sight of your letters concerning the vitrified fortresses in the 'North. I had got formerly from some of my friends, some accounts of extraordinary vitrified walls which they had seen in the Highlands; and Mr. James Wyatt, who spent some time in surveying a part of that country, communicated a number of particular observations which he had made upon one of these ruins; but we were not enabled to judge with any certainty, for what purposes, or in what manner, these hitherto unheard-of buildings had been erected. It is very probable that they were executed in some such manner as you have imagined. There are, in most parts of Scotland, different kinds of stone, which can, without much difficulty, be melted or softened by fire, to such a degree, as to make them cohere together. Such is the grey stone, called whin-stone, which, for some time past, has been carried to London to pave the streets. Such also is the granite, or moor-stone, which is applied to the same use, and pieces of which are plainly visible in some specimens of these vitrified walls, which I received from my friends. There are also many lime-stones, which, in consequence of their containing certain proportions of sand and clay, are very fusible: and there is no doubt that sand-stone and pudden-stone when they happen to contain certain proportions of iron mixed with the sand and gravel of which they are composed, must have the same quality. A pudden-stone composed of pieces of granite must necessarily have it. "There is abundance of one or other of these kinds of stone in many parts of Scotland; and as the whole country was anciently a forest, and the greater part of it overgrown with wood, it is easy to understand how those who erected these works, got the materials necessary for their purposes.—I am, SIR, your obedient humble servant. When I was a young thing. When I was a school-girl, etc. When I was a teacher, etc. When I had a sweetheart, etc. When I had a husband, etc. When I had a baby, etc. When I had a donkey, etc. When I took in washing, etc. When my baby died, oh died. etc. When my husband died, etc. The players, joining hands, form a ring, and dance or walk round singing the words, and keeping the ring form until the end of the fourth line in each successive verse, when they unclasp, and stand still. Each child then takes hold of her skirt and dances individually to the right and left, making two or three steps. Then all walk round singly, singing the second four lines, and masking suitable action to the words as they sing and go: the same form being continued throughout. TREES were at one time worshipped as well as fountains. Ygdrasil, the world-tree of Scandinavian mythology, had three roots, and underneath each, was a fountain of wonderful virtues. This represents the connection between tree and well in the domain of mythology. But the same superstition was connected with ordinary trees and wells. Glancing back over the history of civilisation, we reach a period, when vegetation was endowed with personality. As plants manifested the phenomena of life and death like man and the lower animals, they had a similar kind of existence attributed to them. Among some savages to-day, the fragrance of a flower is thought to be its soul. As there was thus no hard and fast line between man and the vegetable kingdom, the one could be derived from the other; in other words, men could have trees as their ancestors. Curious survivals of such a belief lie both revealed and concealed in the language of to-,day. Though we are far separated from such a phase of archaic religion, we speak of the branches of a family. At one time such an expression represented a literal fact, and not a mere metaphor. In like manner, we call a son, who resembles his father, "a chip of the old block." But how few when using the phrase are alive to its real force! Mr. Keary, in his "Outlines of Primitive Belief," observes, "Even when the literal notion of the descent from a tree had been lost sight of, the close connection between the prosperity of the tribe and the life of its fetish was often strictly held. The village tree of the German races was originally a tribal tree with whose existence the life of the village was involved." Part of the contents of the cup was then drunk, and the remainder, was thrown at the tree amid shouts from the by-standers. Relics of the same cult can be traced in the superstitious regard for such trees as the rowan, the elder, &c., and in the decoration of the May-pole and the Christmas Tree. According to an ancient Irish legend, a certain spring in Erin, called Connla's Well, had growing over it nine mystical hazel trees. Year by year these trees produced their flowers and fruit simultaneously. The nuts were of a brilliant crimson colour and contained in some mysterious way the knowledge of all that was best in poetry and art. Professor O'Curry, in his "Lectvcres on the Manners and Customs of the Ancient Irish," refers to this legend, and says, "No sooner were the beautiful nuts produced on the trees than they always dropped into the well, raising by their fall a succession of shining red bubbles. Now, during this time the water was always full of salmon, and no sooner did the bubbles appear than these salmon darted to the surface and ate the nuts, after which they made their way to the river. The eating of the nuts produced brilliant crimson spots on the bellies of these salmon, and to catch and eat these salmon became an object of more than mere gastronomic interest among those who were anxious to become distinguished in the arts and in literature without being at the pains and delay of long study, for the fish was supposed to have become filled with the knowledge which was contained in the nuts, which, it was believed, would be transferred in full to those who had the good fortune to catch and eat them." In the Loch of the Clans in the county of Nairn, out of which the water has been drained, appears an oval chamber, enclosed by a stone wall; this seems to have been lined with wood. The roof and floor were of undressed oak. The crannog had begun to merge into the castle. The structure in the Loch of the Clans presents a wall twenty feet in extreme width, while the interior chamber is eighteen feet long, sixteen broad, and ten high. These measurements point to its existence at or before the Roman period. But the Celts reared forts of timber long afterwards. If we except the burghs and caers, latterly built of stone, the chief strongholds were up to the tenth century formed of logs. Forts and great houses of timber existed in Morayshire till the thirteenth century. Mansions and strongholds of stone began to prevail in the eleventh century. Prior to the war of independence, the state of architecture in Scotland and England was nearly identical. THAT the south-eastern corner of Scotland, or, in broad terms, the country between Berwick and Edinburgh, is as a whole the most historically interesting region in the northern kingdom, no one, I presume, will deny. Its geographical situation has virtually entailed upon it this distinction since recorded history began. Nor, having regard to the past as well as to the present, can any objection be urged against the title of this book. But it is not mainly for this reason that after some summers of rambling on the English Marches to the south of it, I have ventured to cross the Tweed, a liberty which I trust will be forgiven an Englishman by my readers in the north. For this little enterprise might with truth be designated a re-visitation rather than a fresh departure. Indeed the reminiscent note so frequently sounded in these pages might almost call for some apology if it were not for the hope that occasional glimpses into another and widely different day might peradventure prove of some interest to a younger generation, even of Scotsmen. Moreover, it is at least noteworthy that so far as I know no appreciation by pen or pencil in book form of this distinguished and inspiring region—certainly no recent or accessible one—exists from which those who care to may gather something of it. My attempt to supply one may perhaps move some of those who race through this country so often by mail train to at least an armchair exploration of its features, which at the best are noble and at the worst never commonplace. Joy is a word reserved for few speakers and writers, but Billy Kay stands tall in this select group. His life and his work could be summed up as a “song of joy”. To say he is one of Scotland’s great chroniclers of its language and culture is not an exaggeration. This eloquent performer and broadcaster continues to dazzle his audiences year after year. He is an accomplished writer and author as well as an extraordinaire wordsmith. Born in Ayrshire, Billy possesses an MA degree with Honours in English Language and Literature. He speaks French, German and Portuguese, and I would wager that somewhere there is also a wee bit of Scots and Spanish. At BBC he created the acclaimed Odyssey series of documentaries recording the oral history of the Scottish working class. Billy has written two plays for radio and one for the stage, as well as recently producing an average of ten new features per year for Radio Scotland. He has interviewed nearly 2,000 people from different walks of life and, like Robert Burns, he always brings out man’s humanity. His list of accomplishments and awards would take up several pages, so I will conclude by saying that our readers are in for a special treat. Now I offer a heads-up to all who can take advantage of it. Next week, February 24-25, 2009, Billy will speak at the Symposium, Robert Burns at 250: Poetry, Politics & Performance at the Library of Congress in Washington, D.C. My wife Susan and I will be in attendance and look forward to seeing and talking with Billy Kay. For more information on him and his work, please visit http://www.billykay.co.uk. IN issuing from the press, at this time, in book j form, his excellent essay on the Highlands and Western Islands of Scotland, I am of opinion that Mr. Beaton is conferring a distinct benefit on his countrymen. His little treatise is undoubtedly one of the wisest and best ever written on the subject. The author of the essay now lives in South Africa, where he discharges the duties of an important and responsible situation; and it says a good deal for him that, in the midst of all his toils and anxieties in that part of the world, he can still find time to plan out schemes for the improvement of his dear old native land, and for the amelioration of the material and social condition of its inhabitants. Mr. Beaton is no mere theorist or day-dreamer. On the contrary, as a successful engineer, with an extensive and varied experience, he knows thoroughly what he is writing about; and he clearly demonstrates that the suggestions he makes, if carried into effect, would not only be of present benefit to the Highland people, but would actually pay, and in most cases be a source of future enrichment to the nation at large. I am fully persuaded that in his book Mr. Beaton gives voice to the demands of all reasonable and common-sense people in our Highlands and Islands; and I trust that our legislators will "read, mark, learn, and inwardly digest" his modest and moderate proposals, which, I feel perfectly sure, will be helpful to them in their deliberations on the subject. On account of the great distance between Johannesburg and Stirling, Mr. Beaton requested me to revise the proofs of his volume, a task which I readily agreed to undertake; and I accordingly endeavoured, so far as possible, to correct those small errors in spelling which have such a tendency to creep into a printed book. Of course, Mr. Beaton himself is to be held responsible for the final revision of his work. He had great ideas on how to improve the Highlands of Scotland and some of his thoughts, I think, are still relevant today. Got in another update from this Heritage project in Ontario. It includes a letter in support of the project from Dr Graeme Morton, Chair of the Centre for Scottish Studies at the University of Guelph. The letter includes some interesting information about the Scots in Canada. A recent study conducted by Aberdeen University found that the average Scotsman walks about 900 miles a year. Another study by the Scottish Medical Association found that Scotsmen drink, on average, 22 gallons of alcohol a year!! This means, on average, Scotsmen get about 41 miles to the gallon. Kind Of Makes You Proud to Be Scottish doesn't it!